When it comes to Halloween, I definitely prefer haunted—spooky music, cobwebs and ghouls—to gore. 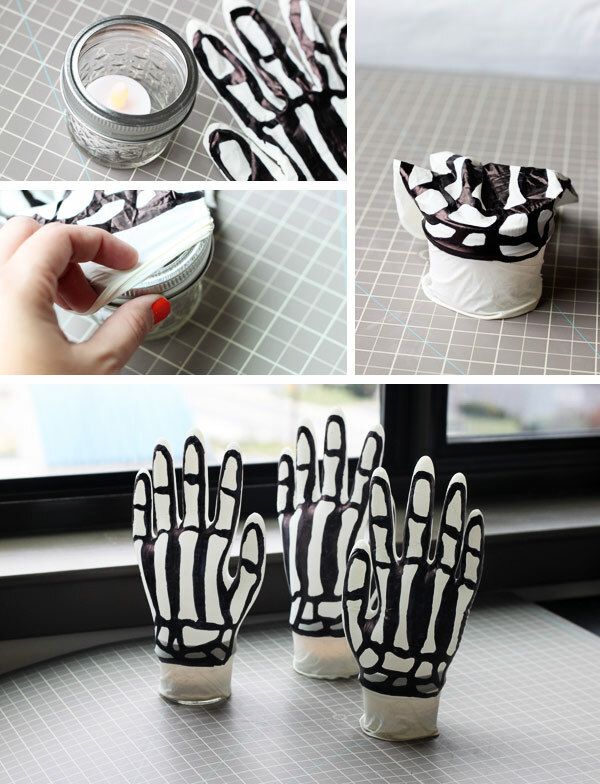 And these super easy DIY decorations are just the right amount of haunting. 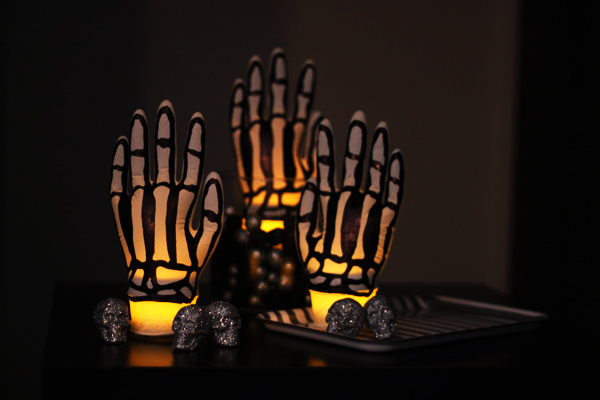 Set at the center of a dimly lit dining room or perched on a porch for Halloween night, these lit-up skeleton hands give any vignette a spooky vibe. And guess what? All you need is a few latex gloves and a permanent marker to complete the whole look. 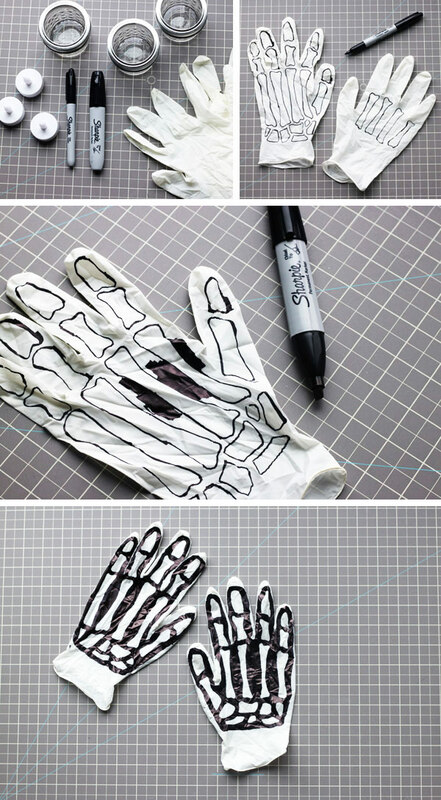 It really is that simple: Pull up some guide photos of skeleton hands on Google Images, then use a standard Sharpie marker to draw some bone shapes onto one side of a latex glove. Start with long bone shapes for the palm of the hand, then shorter ones for the middle and tips of each finger. Complete the sketch with a bunch of smaller triangle-y and rectangle-y shaped bones at the base of the hand. I’ll warn you now: Drawing on latex is kind of tricky. Don’t worry if your lines aren’t perfect—you can always fix the minor imperfections in the next step. Once you’ve got a skeleton hand you’re happy with, it’s time to color in between the lines. I switched to a thicker, chisel-tipped Sharpie marker for this (it gets the job done better and quicker!). Begin to color between each of the bones on the palm and wrist area, then color in a thick border around the outside of the palm and the fingers (about a half-inch). Once your skeleton hands are all inked in, it’s time to make them stand up and light up. Drop a flameless LED tea light—turn it on first—into a wide votive holder or a 4-ounce mason jar (with the ring but without the lid). 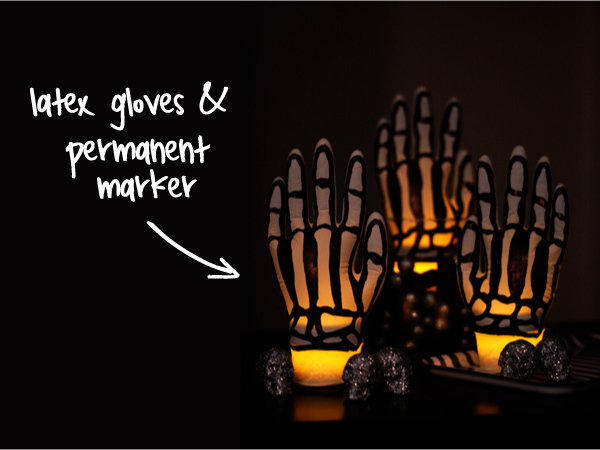 Stretch the opening of your skeleton glove around the votive or jar so it fits snugly and hides the glass. EDIT: As one pinner on Pinterest pointed out, you can also stretch the glove around the jar upside-down. This way, you won’t have to pull the glove off each time you want to turn the LED candle on or off. Why didn’t I think of that? Brilliant! At this point, it will look a little limp, but all you have to do to “raise your hand” (ha!) is blow. Seriously, just stretch the glove out a little bit and blow some air into the glove to inflate it. The latex glove should fit snug enough around the jar to keep the air in. That’s it! Time to put ‘em somewhere dark and moody and get the spooky vibe going! I love it when holiday crafts are this easy and inexpensive, don’t you? Hi, Taryn – that is wicked cool!!! Would it still work ok with a baby food jar after the label is peeled off? Yeah I think that would work great! Anything that’s big enough so the glove can say stretched on without letting air out. I love this, Pinning it. Now have go back to the dollar store for the gloves. Bravo!! I love this idea. Pinning. I have just finished this project. It was very easy and quick to do and it turned out just great. Wish I could send or upload the picture of you. I took the idea of one of the readers and used the mason jar upside down as it is easier to switch the candle on and off. Thank you so much for this idea. I think I will place them on the stairs leading down to our front door so that on Halloween night when the children come for trick or treats they will see them as they open the door. Brilliant…just tried with one glove…doesnt look as nice as yours, have permanent marker all over my fingers and glass table top…but had good fun! Plan to put the other one actually on my hand and than draw it. Also used a drinking straw to blow the air in…Thank you for sharing! It looks like fun and I am gonna give it a try but my latex gloves are blue . Thanks for the idea! Would be cool to do skulls our of white balloons too. Is it ok to share these on our crafts section of our Home Education website http://www.educationalfreedom.org.uk? This is awesome! Will have to practice because my marker worker does not look as nice as yours at all. I used plastic cups instead of a jar.